Hal Draper, the son of immigrant garment workers, was born in 1914. He joined the Socialist Workers Party (SWP) in 1932 and as a supporter of Max Shachtman, helped establish the Workers Party (WP). In 1949 the organization became known as the Independent Socialist League (ISL). Under Shachtman's leadership the party rejected the revolutionary path to socialism. Draper became disillusioned with Shachtman and formed the International Socialists (IS). 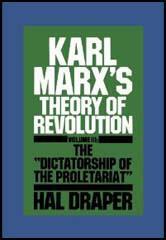 Draper wrote the four-volume Karl Marx's Theory of Revolution and edited the Marx-Engels Cyclopedia. Hal Draper died in 1990.